At 5 Star Pressure Washing, we are committed to providing our customers with excellent service and complete satisfaction. From the first time we step foot on your property, we will treat it like it is our own. With over 10 years experience and thousands of happy clients throughout Northeast Ohio, we are proud to stand behind the 5 Star Pressure Washing brand. 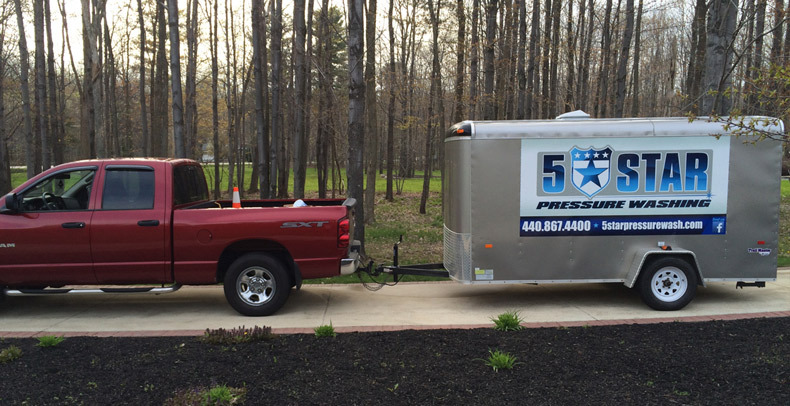 Fully insured and bonded, we service both residential and commercial clients in Lake, Geauga, and Cuyahoga County, Ohio. Free estimates are done at your location and satisfaction is 100% guaranteed! Don’t let your filthy, dilapidated roof, siding or deck bring down the value of your home or diminish the appearance of your business. 5Star can give it a new life! Fully insured and bonded, your satisfaction is 100% guaranteed! Clean, seal or refresh your siding, deck, roof or driveway. No need to replace it – just refresh it. 5 Star will deliver expert, professional results!